The Vermillion Area Chamber & Development Company (VCDC) Sports Authority is pleased to announce that professional baseball will return to Vermillion for a fourth straight summer! 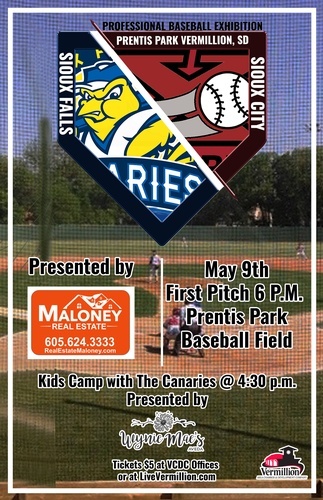 The 2019 Professional Baseball Exhibition, presented by Maloney Real Estate and featuring the Sioux Falls Canaries vs. the Sioux City Explorers, is slated for Thursday, May 9th at Prentis Park Ball Field. The afternoon will begin with a FREE Kids Camp with the pros – sponsored by Wynie Mae’s Aveda Salon & Spa - at 4:30, followed by first pitch at 6:00 pm. The event will include games and inflatables, concessions, and fun promos throughout. Tickets are available for purchase by calling the VCDC offices at 605-624-5571, or by visiting LiveVermillion.com. For more information contact Mike Bartos, Marketing & Events Coordinator, at the VCDC offices at 605-624-5571 or by emailing Mike@VermillionChamber.com.